Its spring and the orange poly tarp completely represents that. If you are having events such as children's birthday parties at the park the orange poly tarp is perfect. The orange poly tarp can be used as a sit down area where kids can be read books, or activities can take place. Also it is great for schools for fire drill practices. The orange poly tarp can be used for so many applications and lets not forget that the quality on the orange poly tarp is one of the best in its category. The orange poly tarp is 4.5 oz per square yard 7 mil thickness, waterproof, mildew resistant, UV treated on both sides and acid resistant. 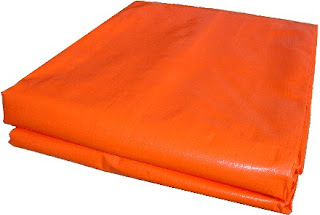 Take a look at our wide selection in sides on the orange poly tarp section. I just bought 3 orange poly tarps the last ones I purchased worked out prety good. Our local fire dept recommended orange poly tarps for emergency situations because they can be seen by everyone. We just made our first order with Tarps Plus. Rebeca H. Del Rey Beach, FL. Get Your Insul Tarp Here! Do You Need Aire Retardant Tarp? Get Your Hay Tarp Today! The Dog Kennel Needs a Tan Mesh Tarp! Tarps Plus Also Carries Truck Tarps! We Have A Heavy Duty Poly Tarp Section! Hurricanne Covers Are Sold Here At A Low Price. Get Your Clear Poly Tarp! Yellow Poly Tarps, Great For The Play Area!